So, many of you read over the newsletter last week, but it appears that no one thought much of it. It didn’t seem all that strange that the next event on the “Coming Soon” list would be “Grenwog Festival”....something which doesn’t normally happen until around Easter, in April? It seems you’ve fallen into my clever trap. Bwahaha. ….oh my, you have no idea how hard it’s been to keep from posting this. How many times I’ve wanted to tip my hand here. But I keep myself to a strict policy of not revealing any more than small snippets of what’s over the horizon. And so, for months I’ve left tiny clues in what I say. I’ve dropped small tweets referencing my work on some sort of large project. All in all, there’s been a lot of secrecy surrounding this week’s events, to the point where I even asked Gal not to reveal this in the “Coming Soon” panel....we wanted this to be a pleasant surprise. But now, it’s finally time to make the big announcement. This week, join us in AQ for....the NEW Nemesis Set! Yes indeed! You’ve been asking for it for a long time, and your requests have not gone unanswered. It has taken a while, but anything worth doing is worth doing the best we can. 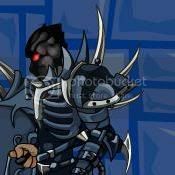 As an “older” player of AQ, Nemesis was my very first set, and I was really proud of myself when I first earned it. I can definitely understand that there is a lot of nostalgia behind this set. I wanted to make sure that, if we were doing a re-imagining of the Nemesis Set, it would be a good remake. Its own story, new art, and of course, new functionality. Now, of course, I’m not perfect, and your expectations are high. I can’t promise this will be THE BEST RELEASE EVAREVAREVAR. But I can say this much: I tried my hardest to make this into something you’d really enjoy, and I hope you do. So throughout this week, I’m going to reveal a few small samples of what to expect, and the rest you’ll see on Thursday. I’ll see you again soon! I’m back, and today’s snippet is a discussion of the new theme of Nemesis, as well as a bit of discussion about the quest. First and foremost, a very short history lesson. The set’s old name was “Nightmare”, and its theme was “fear”. The problem with using that theme in this age, of course, is that Terror already covers that base. With the set’s current name, I felt we should try to take a new approach and give it a theme that the whole set could embody and make into its own. So I did some research into the name. It turns out that the basis of the word “nemesis” is a Greek personification of “justice”, awarding to each what they deserve. In the case of the arrogant, especially those arrogant towards the gods, their “just reward” was divine vengeance and punishment. This seemed like an excellent theme for the set to have, and I wrote the quest with this in mind. In this quest, you seek out a powerful force that has grown dangerously strong deep beneath the surface of Lore. What you discover is the ancient power of a trapped holy warrior whose mighty mace brought swift justice to those who violated the will of the Elemental Lords, good or evil. But beware, for the long time of imprisonment has not bode well for him, and his judgment may be clouded....which could result in serious danger for all the denizens of Lore if he’s not stopped! This quest has a few special features I’d like to discuss. The first one needs to be mentioned, or you may not even be aware of it. This quest’s dialogue (and to a small degree, the way it plays out) will be adjusted based on your Good and Evil alignment. This is something that’s difficult to achieve with a lot of quests, but here, I think it really fits well and should make the quest more interesting for you. The second feature of this quest is one that I think has serious potential for future quests. We have long had a desire to create content that appeals to particular level brackets, but one of the problems is that to do this, we have to deny that quest and that story to anyone too low leveled to play it. This quest has a possible answer to that, in the form of a special “skip” button. The quest starts with easy, low-level fights, and the levels start to pick up later on in the quest. Are you a low-level who wants to enjoy the entire story instead of waiting until you’re into the high levels? Work your way up to the shop with gear that you can use, then hit the “skip” button and enjoy the rest of the ride, with fights replaced by storyline flavor text. You’ll get to see the entire story without being a certain high level. A word of warning, though: once you hit “skip”, you CANNOT undo that decision. This is to prevent people from “skipping” the first few clusters of fights, skipping ahead to the boss, then undoing it and getting the highest level rewards. Sounds nice, but I know what you’re thinking. “Okay, so we have a unique and maybe interesting quest, but LB....what about the set itself?” Well of course, every mastercraft set deserves some interesting functionality that sets it somewhat apart from previous stuff. And so, next time, we’ll get into a little bit of how the Nemesis Set itself will change. Also, good news from Galanoth! We've agreed to let you see the set, one little bit at a time. I'm feeling "generous", so here's the biggest piece of the overall picture. Of course, it doesn't show all that much....but hey, there's still time, and we should enjoy this reveal for the entire week, don't you think? Welcome back! Today we’ll discuss the set itself, how we adjusted things and what to expect as far as the set goes. It’s been a while since we discussed the MC changes, so for answering that question, I have provided this handy chart! This should hopefully clear up what level your gear will become once the changes are completed. Another important thing to note is that the set’s names will be changing a bit. Phobos and Deimos have been removed from the pool of names, and Nemesis will be the name placed on the highest level version of the set. But don’t fret! We’ve arranged to give the existing sets some pretty cool names, using a naming schema quite similar to the Kindred Set (with each piece of the set having both a “tier” name and an individual item name, to make each item’s name distinct and unique), and I think you won’t mind as much as you might think once all’s said and done. Of course, with new names and new art comes new stats and new abilities. Each piece of the set has been redesigned from the ground up with new stats. However, we tried to keep with theme and tradition as much as we could. The armor remains equal in M/R/M defense, and though it has taken on a new duty as the reigning champion of Ice defense, it will most likely remain useful to you in other battles as well due to its special ability....which will really help turn an enemy’s hubris against him. 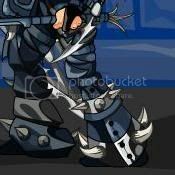 The mace has taken on some of the mantle of the armor, becoming a base-heavy thrashing weapon with even more wicked looking spikes than before. Because of its design and weight, the mace is somewhat inaccurate, but more than makes up for this in sheer combative power. 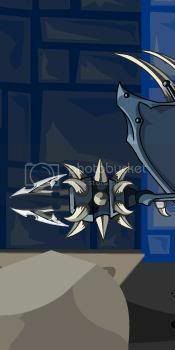 Some say the spikes of this great mace are so jagged and sharp that the more they impact with an opponent’s flesh, the more likely you are to cause them a very serious injury. Or perhaps the mace simply thirsts for blood with more ferocity that its original owner intended. Who knows? The shield focuses on its Ice defense as well, making it one of the best of its kind in that respect. Shields are designed to protect their wielder, and this shield is no different, serving as an extra line of defense in battle to protect its wielder from whatever sort of foe they may face. The set has gained a brand new pet, who has taken a liking to your new outfit and serves as your spiritual guardian. It, too, prefers base damage and power in its attacks. Plus, the more you resemble its former owner, the more it will channel its power to help you in combat when you find that you could use some support. What about the full set bonus? Well, being a holy warrior blessed by the Elemental Lords, it seemed only fitting that you would be able to channel their great magical strength to smite those who dare stand against the might of the gods. And now, for another piece! This one's smaller in size, but bigger in content! It was noted that the picture is facing the wrong way....that is because this is an image of your upcoming foe, Nemesis! Speaking of which, we're currently discussing what sort of monster to make him. We agree he should be more than just a boss, but what sort of boss? Champion Boss, perhaps, or Elite Boss? I’m open to ideas. Give us your thoughts! I hope you’ve enjoyed these little hints along the way, and I hope that you enjoy this Thursday’s release. I can’t promise it’s the best release you’ll ever see, but hopefully it will good enough to meet the standards you have set for us! Of course, for the sake of giving you SOME surprises to look forward to, these notes have only given you a few vague details. You’ll have to come join us this Thursday to see it all! And I promise, there are some interesting surprises yet to see! Stay with us throughout the year of 2011, guys, because I can promise that this is only the beginning. There’s even more fun planned for you! In the meantime, how about one more little piece? Now you can see your opponent this Thursday in full....this is Nemesis, the gods-blessed warrior who poses a threat to all of Lore! Can you stop him? He’ll be an elite-level boss, so you’d better be ready for battle, because the harbinger of divine vengeance takes no prisoners!